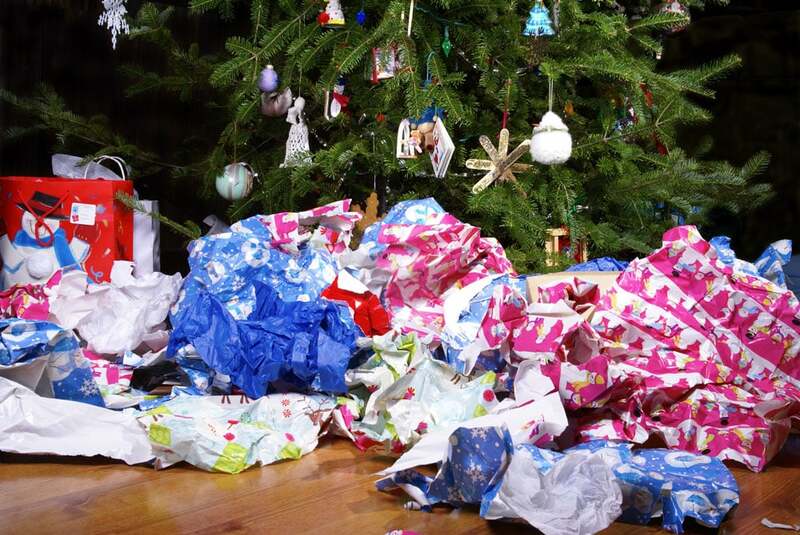 During the holidays the average American throws away 25% more stuff. As the holiday gift giving season begins make sure you reduce your impact on the planet with our tips for eco-friendly gift wrapping and recycling. 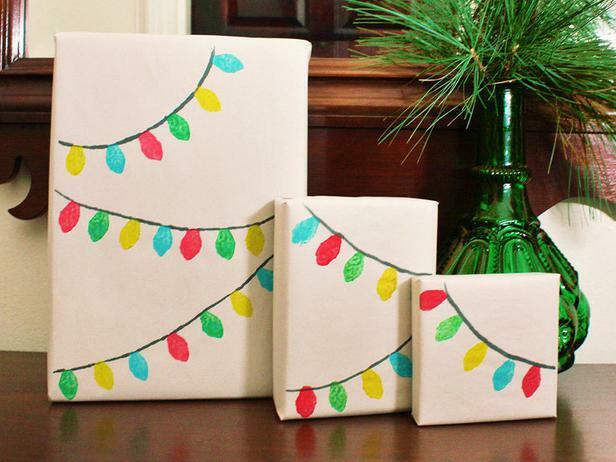 What gift wrap can you really recycle? SCARCE has toured and consulted with local recycling sorting centers (known as MRFs or “Materials Recovery Facilities”) to get you the most up-to-date answer. Keep this info in mind when wrapping or unwrapping your holiday gifts. No metallic paper and no glittery paper . You must also remove all ribbons, bows, bells, pine cones or other decorative doodads. Paper only – You do not need to remove the tape you used to hold the wrap together but try to go light on the tape while you wrap anyways. Gift Bags = RECYCLABLE if they are paper (no plastic bags). You must remove the handles, they are not recyclable. Also, please make sure the bag is empty – no other items (such as tissue, baubles, or plastic gift packaging etc). 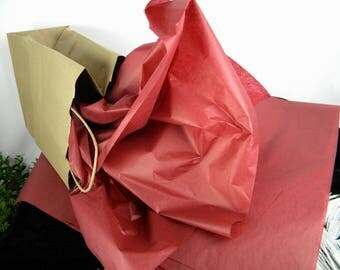 Reuse, compost, or trash used gift tissue paper. Holiday Cards = Mostly Recyclable. No foil lined envelopes/cards, photo paper, or cards with glitter. Also, if you buy the singing cards, the electronic components must be removed before recycling. Tissue Paper = NOT recyclable. The paper fibers in tissue are too small to recycle. Save your tissue paper for reuse or compost it (only if it does not have glitter or metallic bits). Ribbons & Bows = NOT recyclable. No bows, ribbon, twine should be recycled. They tangle up the sorting equipment. Please remove it from your wrap or gift bags before recycling. The plastic spools that ribbon comes on are not recyclable either. Air pillows are not recyclable at home. Plastic Bags & Film/Wrap = NOT recyclable. 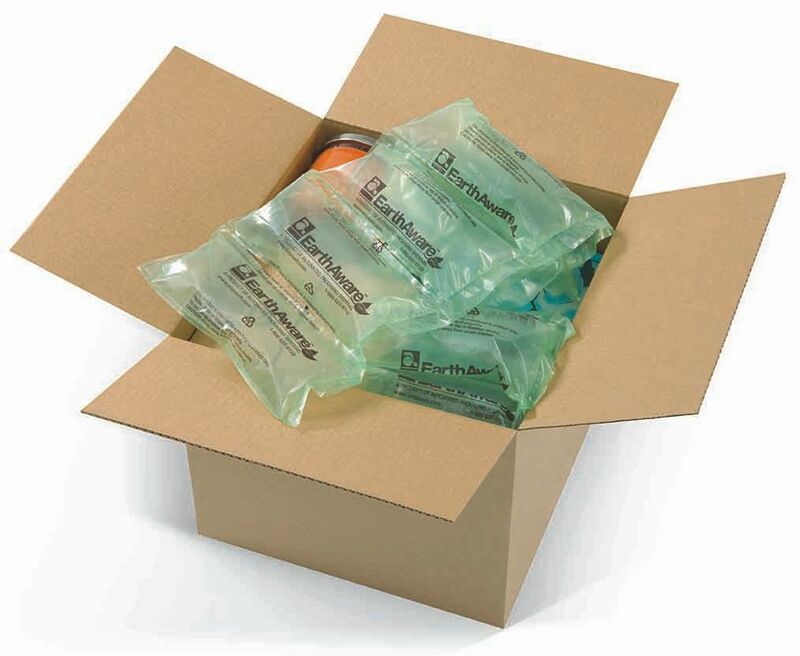 Whether you use little decorative plastic bags for gifts or your online orders come wrapped or cushioned with plastic, no plastic wrap, film, bags or packing material (bubble wrap, air pillows etc) of any kind belong in your home recycling bin. Check out this clip to see why they are a problem. Clean film and bags can be taken to Jewel, Target or other retailers for recycling. It is really important to only put recyclable items into your recycling bin. Haulers don’t make nearly as much money as you may think off our recycling. Adding in items in the hope that they can be recycled (“wishcycling”) or with the thought that “They’ll just sort it anyways” can contribute to big costs for recyclers. All the contaminants have an impact and jeopardize curbside recycling programs. So if you like to recycle, do your best to do it right. Here are some more tips to reduce your waste this gift-giving season. “Reduce” and “Reuse” are the best tactics to lower your impact on the planet. A number of these tips will help you go green and save green this holiday season. Reduce the number of gifts you buy. This may not be the most popular option but to truly reduce your impact, this is the best one. Consider giving the gift of an experience (such as a play, movie theator tickets, a massage) over an item. Go for quality over quantity. Buying something that will last a long time is far better for the planet than a cheap item that may break or wear out in the short term. Buy Gently-Used Gifts. You can often find high quality used books, music, and movies online or in resale stores. Opt for print-at-home gift cards or certificates as the paper can be recycled after it is used – plastic gift cards cannot. Amazon, for example, has cute options for you to choose from or consider making your own custom gift certificate on a free design website such as Canva. Adorable DIY grocery bag gift wrap. Avoid the non-recyclable wrapping items we highlighted above! Opt for reusable gift bags, save tissue and gift tags for reuse, and hang on to those stick-on bows – they can easily be taped on to next year’s gifts. You could also purchase fabric ribbon that can be tied and untied over and over again. Re-purpose used holiday greeting cards as gift tags. All you need are scissors and old greeting cards. Check out this simple tutorial. DIY Wrapping Paper. Save resources and money by reusing paper grocery bags or the comics section of the newspaper to wrap gifts. The internet is full of inspiration. Here are Grocery Bag Wrapping Instructions from Instructables to get you started. Wrap a Gift with Fabric. Use decorative fabric to wrap your gifts. The japanese practice of furoshiki is like origami but with fabric and can be used to decoratively wrap just about any item. The fabric can be used for years-worth of gift-giving. You can even get cloth specifically for furoshiki wrapping. Furoshiki style fabric wrapped gifts. 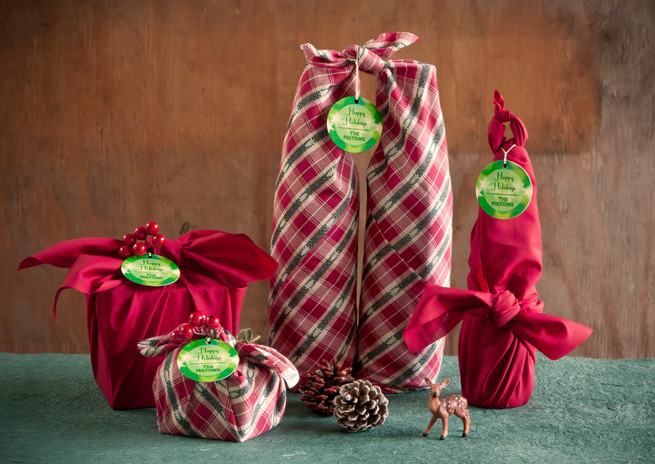 Reusable and beautiful holiday gift wrapping. Still not sure what can and can’t be recycled? Feel free to contact us with your recycling questions.